Looking for hotspots while the world gets hotter: multi-species genetic data inform landscape-scale conservation in the face of climate change in the San Joaquin Desert of California. Global climate change can create patterns of biodiversity where once-widespread species become restricted to small islands of persistence, commonly called climate refugia. Species can subsequently recolonize the intervening spaces between the islands, masking the historical range restriction. Advances in molecular genetic technology now allow us to see the signature of these historical restriction events. In our ongoing study of desert vertebrates in the San Joaquin Valley, we are layering patterns of population subdivision from multiple species into a composite map of historical population centers. We have significant population subdivison as well as pattern concordance among some species, suggesting past refuges in the Panoche Hills and the Carrizo Plain. 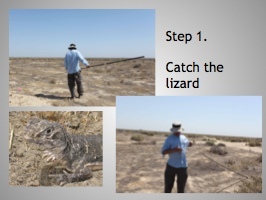 A parallel study projecting the distribution of the blunt-nosed leopard lizard following the current climate change event shows both spots as potential refugia, suggesting the tantalizing possibility that contemporary hotspots may serve as future redoubts. This entry was posted in discussion, presentation, scientific topic and tagged conservation, desert, ecology by snarayan. Bookmark the permalink.